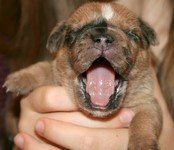 A Queen Elizabeth Boxerbear Cub is so pretty in its plush honey or silver grizzled pug colored coat. And now we have black and white or red mahogany colors. Their muzzles are masked in black or soft shades of gray. Some are flashy with white socks and chests and a stripe between their eyes. Some are brindle. 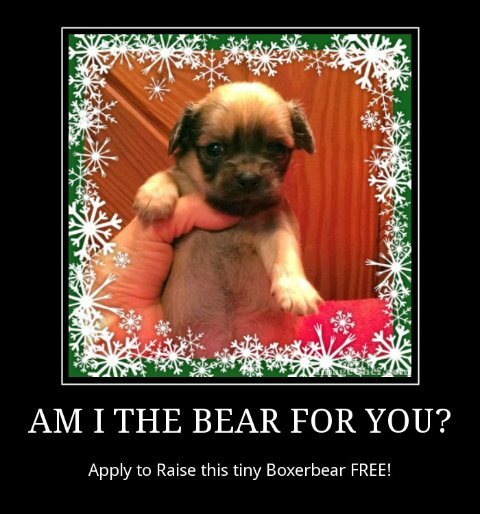 Having a pug and beagle heritage Toy Boxers are a miniature mastiff dog breed only resembling the standard Boxer. They are small in size, falling between 5 to 20 lbs. depending on the parent's line. They often act like a clown and are very good at climbing or doing tricks, they are so nimble on their feet. Guaranteed to make you laugh! Not easily injured, they are sturdy little dogs, and love children. They don't have health problems, and with their short coat, they are easy to maintain and seldom need grooming. this is not a breed with difficulty breathing or troubled by heat intolerance. Boxerbear Toy Boxers make ideal Emotional Support Animals because they are confident little dogs. They love children and adults and they have energy to keep up when you want to play. But when you are quiet, they are too. They are gentle in temperament and pay attention to what you want from them. They love to please. They house train well. 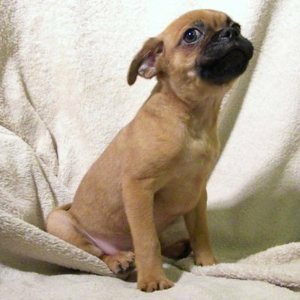 Growing to about one sixth of a standard Boxer in size, they are cute and love to cuddle and be held.